May 22, 2004, ten days before the tragic accident. The daughter of Ann and John Eichinger, she was raised in Los Gatos, California and has an older sister Heather, and a younger brother Chris. Even as a child, Tara has always been determined, and very conscientious. She is often described as being a "self-starting go-getter." At 6'3" tall, she has always had a slightly elevated view of life. Tara is an embodiment of the concept of "Pay it Forward" which tries to change the world, one favor at a time. Tara is always doing things for other people and putting their needs before her own. Tara played basketball in high school, played French Horn in the school band, modeled, acted in many theatrical musicals and was very active in the youth program at Calvary Church of Los Gatos. Tara loves music and enjoys singing and playing the guitar and keyboard. 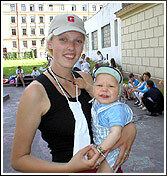 She went on three summer missionary trips to help teens in Latvia and build an orphanage in Romania. Tara absolutely loves little kids and never passes up the opportunity to show them love. At the beginning of her junior year in high school, Tara decided to take her high school equivalency exam and move on to college level studies at the age of 16. She attended West Valley College, San Jose Christian College and graduated on May 5th at the age of 20 from Colorado Christian University with a degree in Psychology. Tara plans to begin working on her Masters degree this fall. Tara has a special talent when working with children. She hopes to become a youth counselor. It was at church that she and Josh met and fell in love. Tara and Josh decided that it was important for Tara to get her degree before they married, and she pursued it with the same determination that is such a strong trait of hers. Tara graduated college and married Josh two weeks later. 10 days after her wedding, while returning home to Colorado, they were involved in the accident.